Back in October 2012, Philips launched its "hue" line of iOS-compatible LED light bulbs, giving users the ability to set and control light colors and intensities right from an iPhone app. With various "recipes", users can select from preset and customized lighting scenes to fit a variety of situations, from reading to relaxing to concentrating and more. Philips has expanded the Hue family several times since the initial launch, including a "Friends of hue" accessory line of light strips and table lamps, as well as new BR30 light bulbs for recessed lighting fixtures. 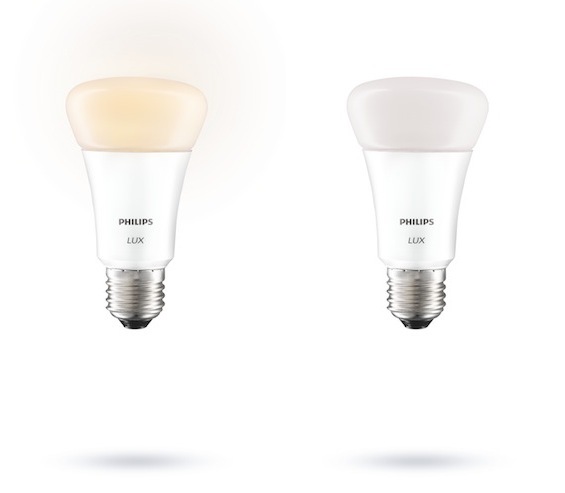 The Hue family is set to expand again, with Philips today announcing three new upcoming products. The first is known as "hue lux", a light bulb similar to the existing hue bulb but which can only emit white light. While hue lux lacks the color options available with the original hue, users can remotely control the brightness of hue lux, set schedules, and more. Hue lux launches this summer with a starter kit consisting of two hue lux bulbs and a required bridge device to set up the hue network for $100. Additional hue lux bulbs will be available for $40 each, compared to the $60 price tag for the original hue with colors. The second product Philips is announcing today is "hue tap" a round mountable switch to make it easy to control hue lights without needing to access the hue iPhone app. 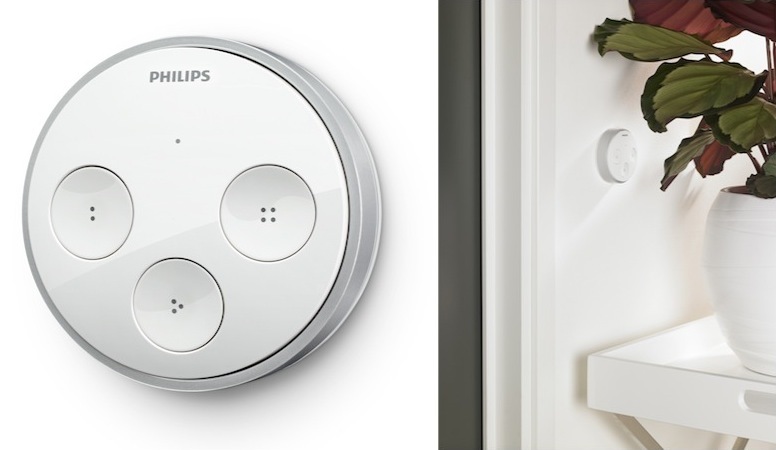 The hue tap includes four buttons to store lighting recipes that are accessible with a simple tap. The hue tap requires no wiring or batteries and is powered simply by the kinetic energy from users tapping on the switch. The hue tap will be available in the second half of this year and will be priced at $60. 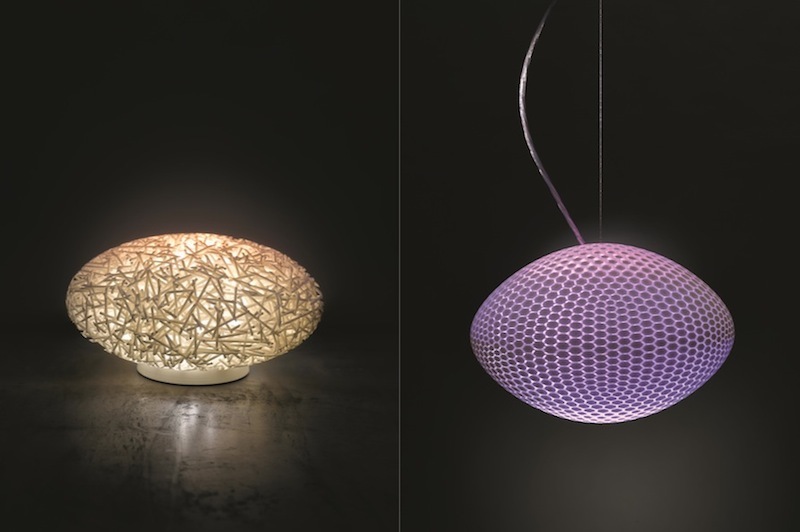 For the more adventurous, the final hue products being announced today are new 3D-printed luminaires. Available in both table and hanging pendant versions, the lights serve as art pieces that integrate with the hue system with palettes of over 16 million colors. Pre-orders for the luminaires begin on March 31, with the pendants priced at 2999 euros and table lamps priced at 2499 euros. It's a no-brainer that they're doing this, but $40 a bulb is just too expensive! You can get good quality, good warranty, 25 year white LEDs for around $10, even from Philips. I'd maybe pay $10 for the privilege of using my iPhone to control them. But a $30 surcharge per bulb? It's just too much. I'm really disappointed. I'm a big fan of Hue and as a person with ADD, it has certainly changed my life. I get visual cues that snap me into a routine I set for myself, sometimes without even noticing it. For example, when I'm supposed to be working, my lights are a bright white which helps me stay focused. When it's time to put down my work and unwind, my lights go a deep blue and I get the feeling to relax. When it's time to eat (people with ADD can forget to eat believe it or not), my kitchen spotlights light up my counter. Other useful functions, fit in the Internet of Things category. Every morning, I step on to my Withings scale. It keeps track of my weight and if I'm falling below the target weight my personal trainer set for me (I'm trying to gain weight), my kitchen LEDs will turn red and I know I need to do better at eating more calories. Another one of the great uses is a tie in with my Calendar. If I have a high priority item coming up, one light near my desk will flash red. This could just mean it's time to leave to an important appointment or that an important project is soon due. Finally, it's so nice to wake up to a glowing sunshine in your bedroom even though it may be gloomy and raining outside. All that said, I'm lucky I live alone because when I have visitors, my whole system falls apart because nobody knows how to turn on the darn lights. So glad they finally brought out a switch. Looks to me like that's just for the current Hue bulbs (see: "16 million colors" for all), nothing about the Lux in there ... yet. My SO never managed to understand why I spend 15 minutes standing in the lightbulb aisle. To everyone that "doesn't get it", I'll guess that the main [only] reason you're not interested is the price, and I get that. But once you replace some of the bulbs around your home with these bad boys, there's no going back. Being able to dim, geofence and color your lighting any way you choose is incredibly useful, not to mention damn fun. Watching it blow peoples' minds is also an added bonus. Sorry for my narrowed-thinking, but I'm not getting the point of all this. I also clicked all the article links assuming one would eventually lead to something other than MR. (http://meethue.com/en-us/inside-hue/tech-specs/) Lots of details in there actually; it is one thing I do actually appreciate about this lineup. Fail on the round surface mount switch, well, unless you like sticking things on the wall. I'm glad they addressed the issue of not having a way to control lights w/o IOS device. Why not produce a replacement for a standard light switch, where you actually HAVE power to run and make it a mini-controller (read decor form factor). I am still on the 'not for me' side of the fence to to the 1 fundamental flaw in the hue bulb design (I say the bulb, not the system). My friend invested quite a lot in bulbs, bedrooms, living areas, etc. Nine so far. Here's the problem. Power outage, regardless of the state of each bulb when the power went out, the turn on at full white brightness when the power returns. Imagine at 3am you are in bed and you have a power interruption, then your entire house lights up. Sorry, that is not for me. The bulbs need some sort of nvram to remember the state of the bulb if they lose power. I have some Hue bulbs in use around the house (starter kit) and so far that's all I'm investing.